RegSeeker is a tool specialized in the management, cleaning and optimization of the Windows Registry, that can be responsible for our system being totally unstable or not to reach the awaited performance. Using a clear and simple interface we will have access to various utilities that will help us to search for errors, view listings and eliminating the erroneous entries. The interface, that is very intuitive, leaves the access to each of the functions on a sidebar, allowing us to see the details and the progress bar for each action in the central area of the window. The program will allow us to create backups of the Registry file, use an auto-clean option, configure various Windows options and view the history stored by the Internet Explorer (as well as being able to eliminate it). 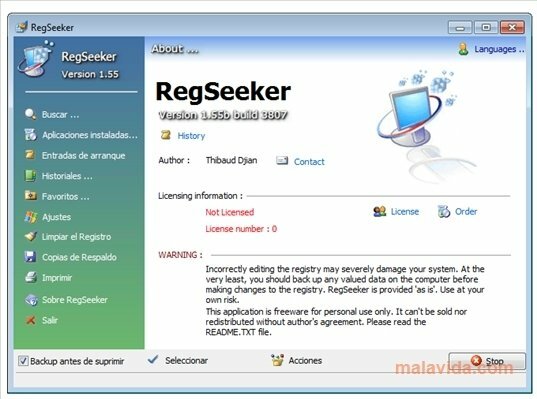 If you want your computer to work properly, get hold of a utility like RegSeeker, that will offers you the option to maintain the Windows Registry files in good conditions.